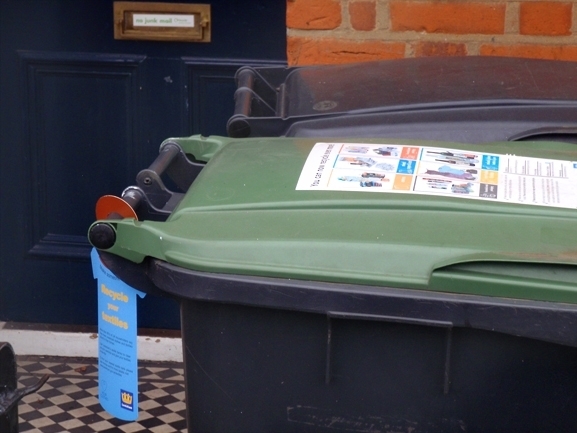 Over the last week you might have seen a blue tag hanging on your recycling bin. 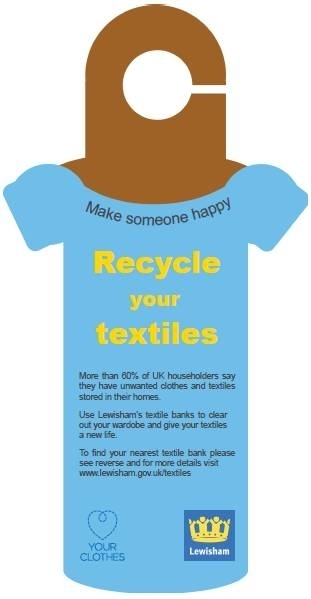 Lewisham Council are keen to make sure that everyone’s recycling all they can, including their textiles. More than 60% of UK householders say they have unwanted clothes and textiles in their homes. We’d like to see these clothes being put to use and the clothes given a second chance. You might have seen these hanging on a recycling bin near you. These blue tags are an encouragement to all our residents to take a look at their wardrobes to clear out any unused textiles and recycle them by using one of the many textile banks located around the borough. Full details of where your nearest text bank is can be found on the bin hanger. 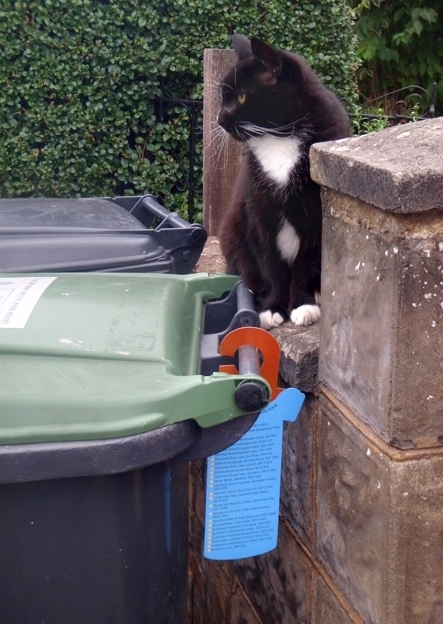 A friendly cat approves of the new bin hangers. Categories: Uncategorized | Tags: Bring banks for textiles, Clothes bin hangers, clothes recycling, LM Barry, LM Barry textiles, LMB, recycling clothes, recycling clothing, recycling curtains, recycling your textiles, reusing clothes, reusing textiles, textile banks, textile recycling, textile reuse, textiles | Permalink. Last Friday, the middle of Lewisham Shopping Centre was transformed into a vintage shoppers delight when the Lewisham Recycling team held a ‘Big Swish’ to raise awareness of the new textiles banks across the borough. The term swishing refers to swopping of items, often clothes, where someone swops a garment that they no longer want with someone else’s unwanted item. The swishing began at 10am and luckily even early visitors had a plentiful supply of quality clothes to choose from. Much of the stock already on display was sourced from Lewisham’s new LMB textile banks. The quality of items on offer was very impressive, with clothing ranging from vintage garments, high street brands and designer labels. The event was very well attended and a total of just over 80 garments were ‘swished’. Lewisham East Member of Parliament – Heidi Alexander, also came along to show her support for textile reuse and brought along a number of ‘swishable items’. 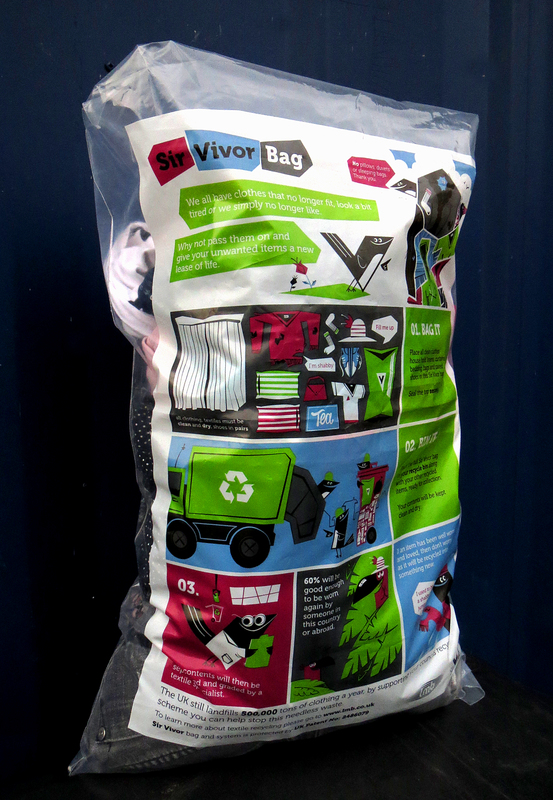 Please bear in mind that textiles can still be placed into your recycling bin, but if placed in our textile banks there is a better chance of the item being reused rather than recycled. Remember – Reuse is always better than recycling! And if you can’t get to a textile bank then there is always the option of using your local charity shop. 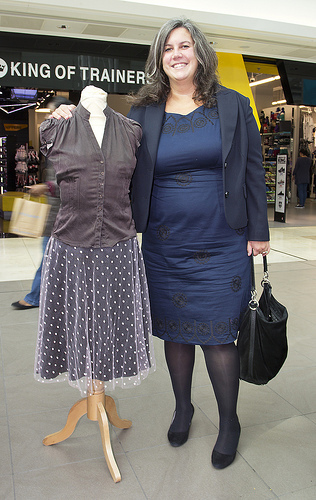 Categories: recycling, Textiles | Tags: clothes swapping, Heidi Alexander MP, Lewisham Shopping Centre, LM Barry, LMB, locvations of textile banks, recycling clothes, recycling clothes in Lewisham, Recycling textiles in Lewisham, swishing, swishing event in Lewisham, swishing in Lewisham, swishing in Lewisham Shopping Centre, textile bank locations, Textile banks in Lewisham, textile recycling, textile recycling in Lewisham | Permalink. Once the media have finished clambering for stories associated with London Fashion week, they’ll turning their attention to the next big event in the fashion calendar. That will be the Big Swish Event that will be taking place in Lewisham Shopping Centre a week later. Already the event is generating a great deal of interest and momentum with lots of people contacting the recycling team to ask about when it all starts and what kind of clothes to bring along to swish with. 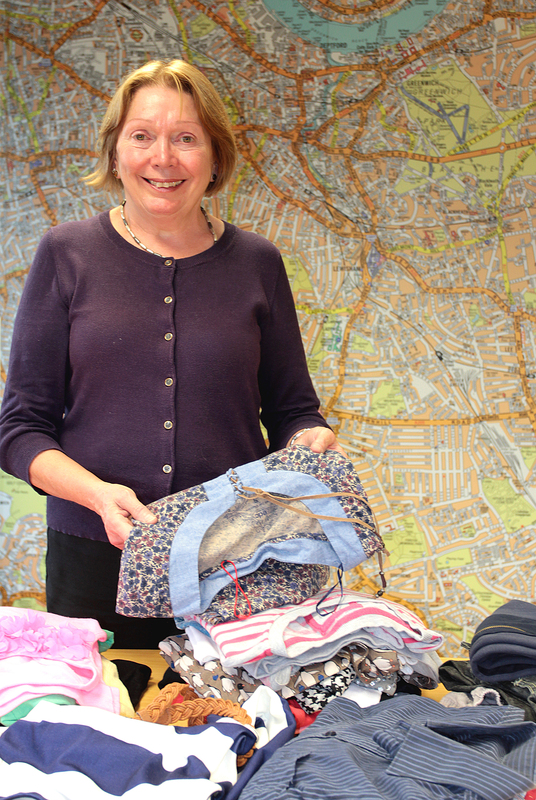 Several bags of quality clothing have already been collected and this week, so Councillor Susan Wise, Cabinet Member for Customer Services came to our offices to give us a hand in sorting some of them out. Councillor Susan Wise helps with sorting clothes for the swishing event. 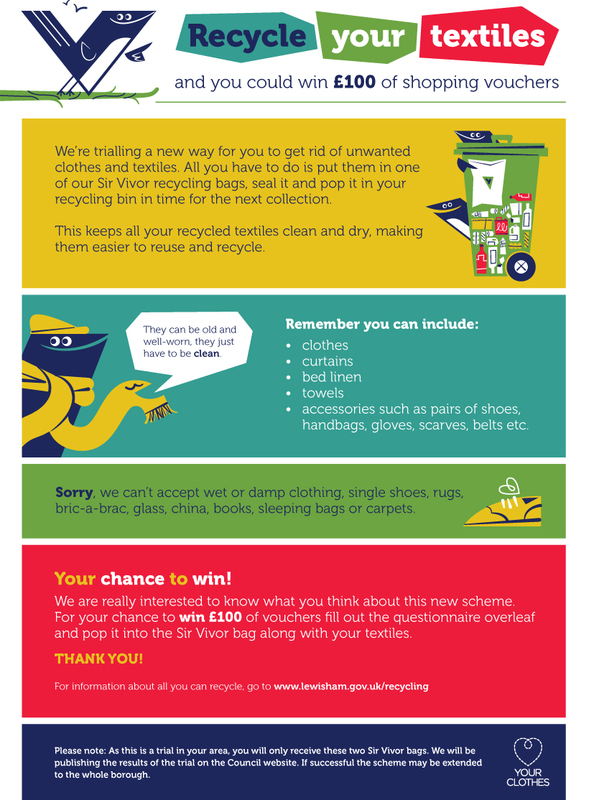 The event is being staged to raise the profile of textile recycling, and whilst we collect textiles in the recycling bins, we would prefer residents to use our textile banks where there would a better chance of keeping the quality of the item intact. Residents can also choose to take textiles to charity shops if they wish. The event will be taking place at the site of the old Ponti’s restaurant in the shopping centre between 10am and 4pm on the 27th September. 10 other local authorities have also been invited as they were part of the huge tendering exercise that Lewisham Council led on that saw all the authorities getting a much better price for all the textiles collected. Heidi Alexander MP will also be lending her support to the event and will be popping in around 12.30pm. Details of where all our banks are located can be found below. Find a bank near you and drop off your textiles. Please come along with clothes that you would like to swish with and enjoy the fun day out. Categories: community engagement, Environmental Campaigns, reuse, Textiles | Tags: Bring banks, Cllr Susan Wise, Councillor Susan Wise, Fashion, fashion and design, Fashion in Lewisham, Heidi Alexander, Heidi Alexander MP, Lewisham Fashion Day, Lewisham Shopping Centre, LM Barry, LMB, London Fashion Week, Susan Wise, swishing, swishing in Lewisham, swishing in Lewisham Shopping Centre, Textile banks in Lewisham, textile recycling, textile recycling in Lewisham, textiles | Permalink. The Lewisham Council led, pan London textile procurement process finally came to a finish recently with the award of the contract going to LM Barry (LMB), a textile recycling company that are based in east London. Potentially, 11 London local authorities could benefit from this innovative procurement process. A process that took many months and an equal amount of meetings to put together. 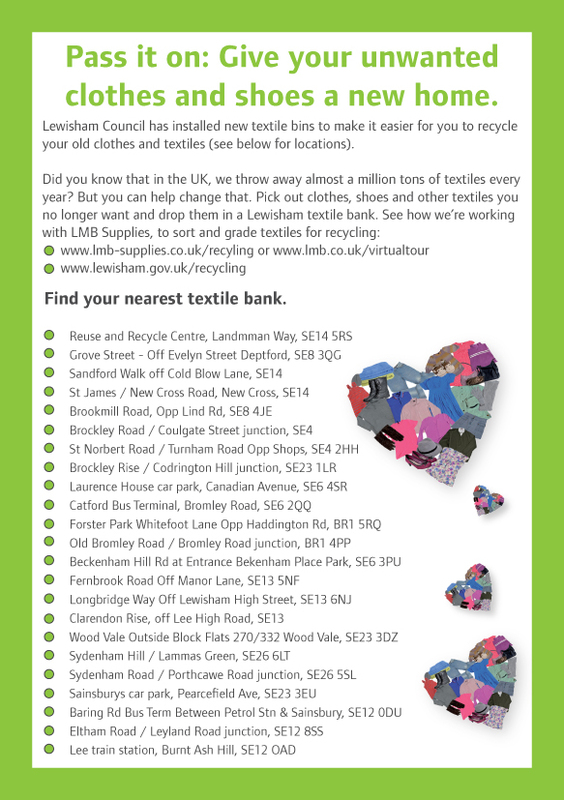 The new contract which Lewisham has entered into with LMB means that the Council will receive a greater level of income for all the textiles that are deposited in the brand new banks. Many residents may have already seen the dark blue textile banks popping up at existing bring sites around the borough to replace the old green ones. 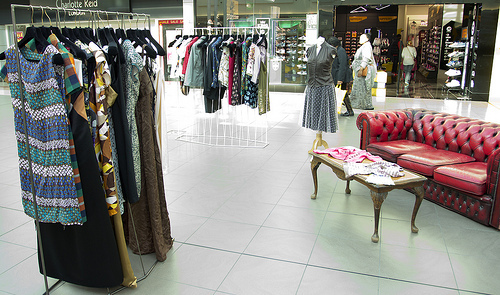 Bring along an item of clothing and exchange for something else – that’s swishing. To launch the service and publicise it further, the Council are staging an event to highlight the kinds of textiles that we want residents to put into the banks. This will also be an opportunity for residents to see the sort of items that are reused and recycled every day through the textile bank collection service. The event, which is being held at Lewisham Shopping Centre is known as a ‘swishing’ event. Swishing has grown in popularity in recent months with many people staging events in their homes amongst friends and family. Swishing involves people bringing along a suitable item of quality clothing to the event and then take something home of equal quality that they like. Full details of this event can be found on the poster above. 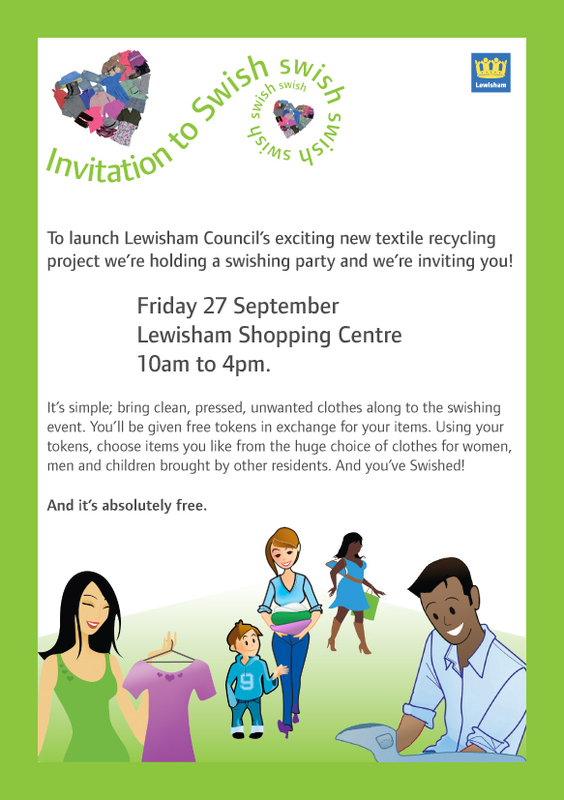 Staff from Lewisham Council will be on hand to answer any questions and queries about the new service as well as help out with the categorizing of the clothes and ensuring people find something they like which they can take home and use again. Please use this opportunity to bring something that you have forgotten about or no longer wear and wish to exchange for something different that you will appreciate and wear more than the item you brought. The event will run from 10am to 4pm on Friday 27th September 2013 at the site of the old Ponti’s restaurant in the middle of Lewisham Shopping Centre. Everyone welcome. 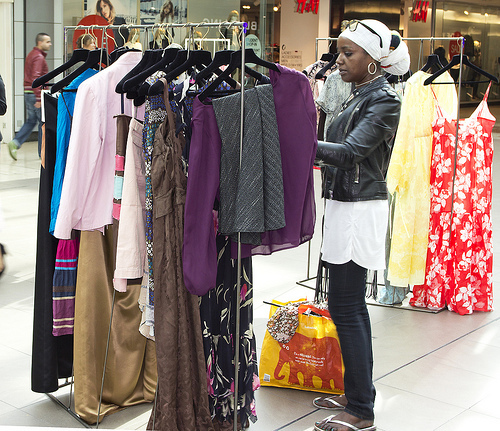 Categories: community engagement, Environmental Campaigns, Textiles, Uncategorized | Tags: Bring banks, clothes swapping, LM Barry, LMB, recycling clothes, recycling clothes in Lewisham, recycling clothing, Recycling in Lewisham Shopping centre, Recycling textiles in Lewisham, reuse, reusing clothes, swapping clothes, swishing, swishing in Lewisham, swishing in Lewisham Shopping Centre, Textile banks in Lewisham, textile recycling, textile recycling in Lewisham, textiles | Permalink.